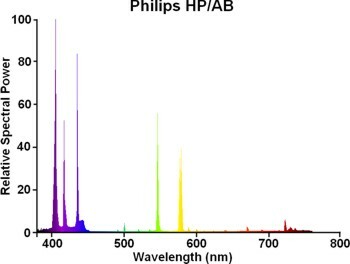 The HP/AB lamp is one of the earliest metal halide sources designed to provide an ultra-violet spectrum. 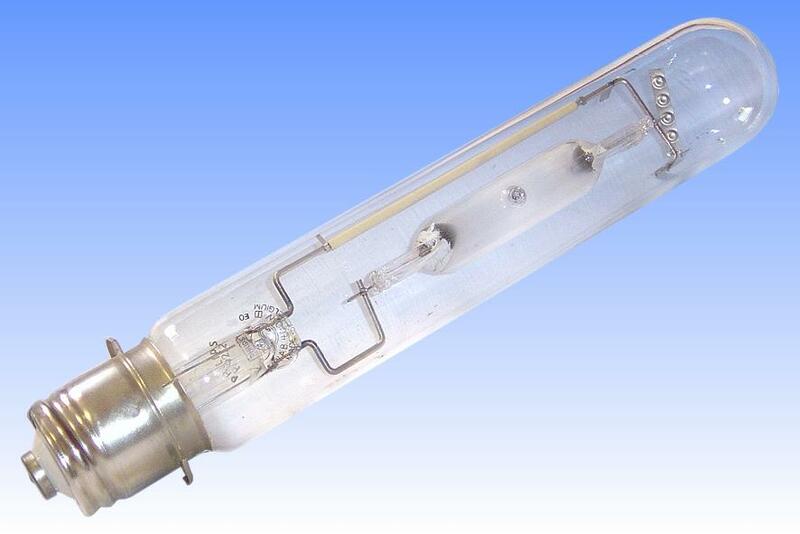 The arc tube is dosed with lead and gallium iodides, radiating UV-B and UV-A in the region of 280 to 440nm. The lamp is intended for photochemical processes, but was superseded by the HPM family and discontinued in the early 80s. 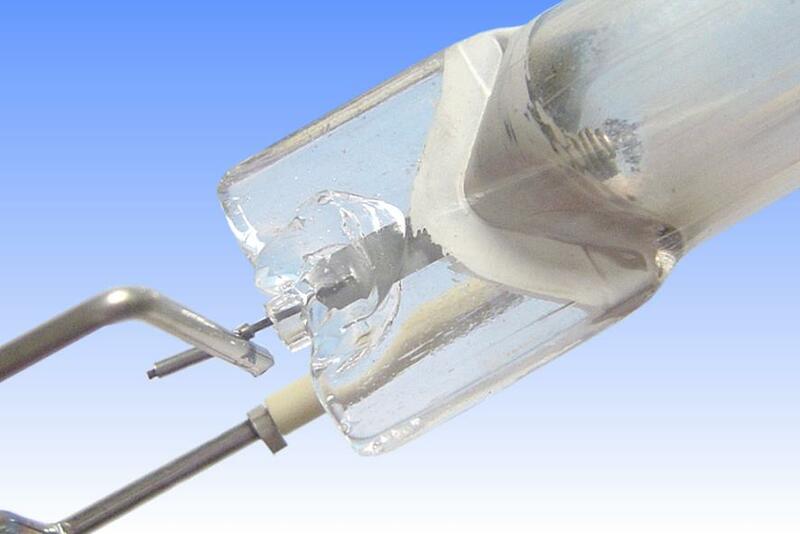 It follows the design features of Philips' early HPI metal halide lamps. The arc tube is of somewhat larger volume to achieve optimum efficiency of UV generation. Heat reflective zirconia coatings are present behind the electrodes. 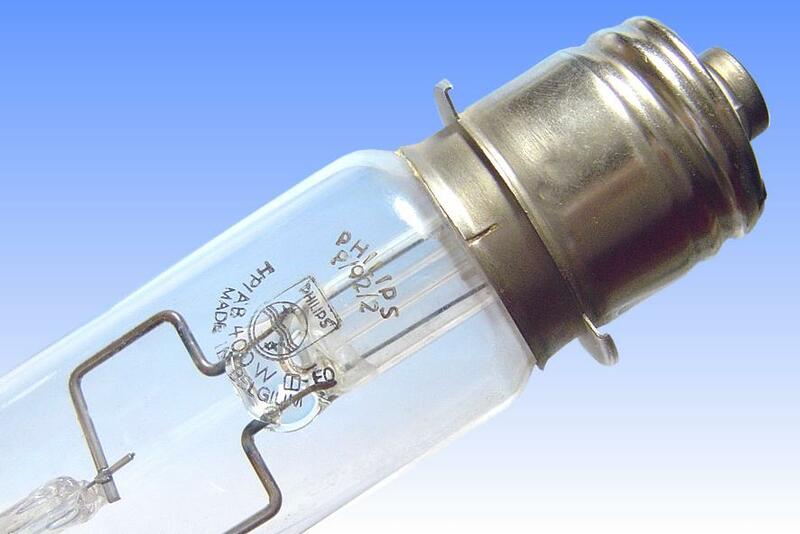 The arc tube is mounted in an outer bulb filled with nitrogen to protect the seals and a zirconium getter is present to reduce hydrogen impurities. A P40s pre-focussed cap permits accurate alignment of the arc tube in the optical apparatus. Incidentally the close-up photo of the pinch seal reveals a curious design feature of early Philips metal halide arc tubes. To attain high purity, the Philips process involves first tipping off the arc tubes with a long exhaust tube, followed by a 40-hour furnacing to bake out impurities. Then they are re-pumped and the exhaust tube short-tipped. This furnacing process was originally carried out in air, which would of course cause oxidation and failure of the moly foil seals. Protection was applied by melting two small quartz tubes over the lead wires of each seal and pumping them to rough vacuum. After furnacing the quartz tubes were cut off, some of the residue can be seen here. The process was labour intensive and a small army of women was employed in attaching, evacuating and removing these tubes. During the 1980s Philips changed to furnacing in an inert atmosphere and the process was abandoned.